What’s in the Crayon Box? Paper Clips, of Course! Perspective-taking means recognizing that other people have thoughts and feelings different from our own — and being able to imagine what they might be. Your preschooler is just beginning to learn perspective-taking. You can help by encouraging them to think about other people’s responses to everyday situations. They’ll answer, “crayons,” of course. Now show them what’s really in the box. They’ll probably be surprised; you fooled them! What will your child say? Your preschooler is just beginning to learn perspective-taking. For many of us, it’s a lifelong endeavor. I, for one, am still honing my perspective-taking skills in my fifties! 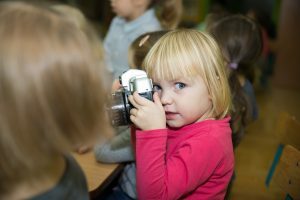 Gopnik’s research shows that preschool-age children learn perspective-taking best through direct experience. If your child says her friend would say the crayon box has paper clips in it, call the friend over and encourage your child ask her what she thinks is in the box. Your child will see with her own eyes that her friend thinks the crayon box has crayons in it. She will come to understand that her friend knows and believes something different from what she knows. Books offer another excellent opportunity for this kind of conversation. After reading an Arthur book you might ask, “Why do you think Arthur got mad at D.W.?” Or after reading Where the Wild Things Are: “Why do you think Max was causing trouble?”4 TV shows and movies also offer many opportunities to talk about the feelings and intent of their characters. Ellen Galinsky describes this research on pages 80–83 of her book Mind in the Making: The Seven Essential Life Skills Every Child Needs.